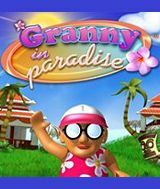 Download Granny in Paradise for free at FreeRide Games! In Granny in Paradise, Granny's goal is to rescue her cats from bad guys and dogs and guide her precious kitties to safety. As Granny, you'll have to climb up and down ladders, jump off cliffs and dig holes to catch the bad guys. Each time you save a group of kitties, you progress to the next level. And to make things even more fun in this entertaining Arcade game, Granny does not disappoint with lots of witty and funny remarks that endear her even more. 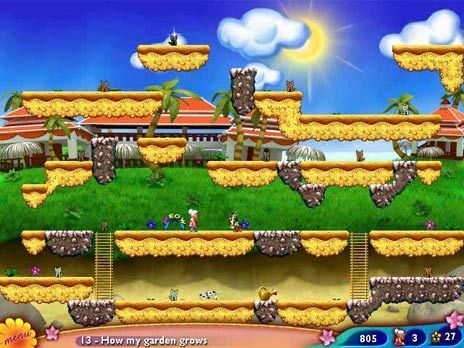 As you play, flowers play an important role in Granny in Paradise. Sometimes you may come across hidden flowers that sprout in your path, for example, scoring you bonus points. You can also use other objects scattered on the playing board to give you special powers. Granted, it's not a typical vacation in paradise, but Granny's endless determination to accomplish her mission of saving all the kitties is often hilarious and sure to entertain Arcade game fans of all ages! Over 170 levels of Granny adventures. New items such as teleporters and moving platforms.